When you're looking for the perfect combination of comfort, luxury and affordability in a Las Vegas casino hotel, there's no better choice than Palace Station. 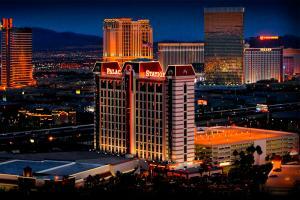 A glass elevator ride up from the casino brings guests to the luxurious Tower King rooms. At 360 sq. ft., each beautifully appointed room is styled in modern décor and features one King bed and two comfortable armchairs. Located just minutes from the Strip.